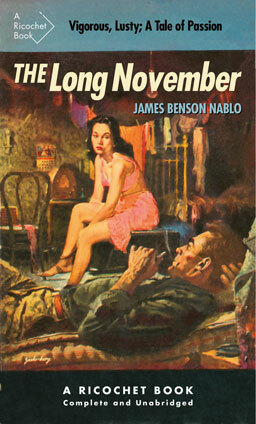 The Long November is a novel about World War II by Canadian author James Benson Nablo. The basic plot is that Joey Mack, a not-quite-so-young canadian soldier is reflecting on his life while lying wounded in Italy. His life runs from rum-running in the 1920s through mining, the depression, and then the war. The leitmotif in all his thought is Steffi, the young girl from a rich family of whose affection he has spent his life trying to deserve. The main thing about this book is that it shows the “greatest generation” as something other than dutiful, non-complaining people. They have somebody they blame for the world they find themselves in.